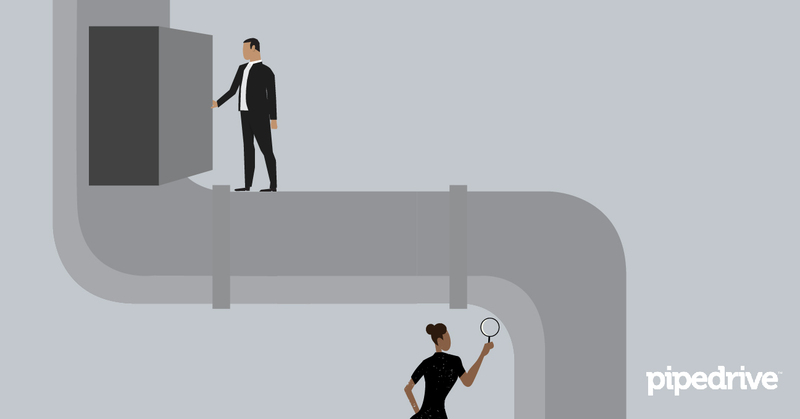 Sales pipeline — a term that gets thrown around so much, you’d be forgiven for thinking it’s an empty catchphrase that simply makes salespeople who use it look like sales professionals. But your sales management operations can benefit from using a sales pipeline, and it could make a significant difference to your bottom line. “It’s not a matter of whether you’ll get improvements. It’s just a matter of how much,” said Mark McInnes, who was recognized by LinkedIn as Australia’s No. 1 social seller and serves as an execution coaching partner at Sydney-based SalesITV. A sales pipeline is a visual and systematic approach to selling a product or service. It allows salespeople to get a grasp of exactly where their money, deals, and other sales efforts are at all times (we’ll dive more into the pipeline below). McInnes spoke about a client who wasn’t using a sales pipeline, and as a result, they had “little or no stats at all” about how effective their sales process was and whether their business was headed in the right direction. A sales pipeline can be compared to your doctor doing a blood test. “You can read a lot into what’s wrong and what’s right about you, and it enables the management to apply the right fixes to make a ‘sick’ company healthy,” said David P. Wallace, who has more than 30 years of sales and marketing experience and serves as the principal and founding partner of the New York-based Sales Management Group. A sales pipeline can also be seen as a funnel that contains a set of opportunities the salesperson has identified. As more and more of those opportunities, or leads, move throughout the funnel, the salesperson is able to determine which ones will close. As you move through the different stages of your pipeline or funnel, the chances of a deal closing increase. Maybe they show interest and the chance goes up to 30%, then you do a demo for them and the chance goes up to 60%. By the time the lead reaches the narrowest end of the funnel, when you agree on all the terms of the deal, you’ll have a 100% chance to close it. The visibility a sales pipeline provides serves as the foundation to increasing your company’s bottom line. A sales pipeline is close to most salespeople’s hearts because it’s where all of their money sits. Michelle Seger, executive director and global practice lead at Atlanta-based SalesGlobe, helps companies from around the world improve their sales results. She explains why a proper sales pipeline is so important. The sales pipeline can be constructed in various ways — sticky notes or an Excel spreadsheet. But if you have a complex or long sales cycle, you may want to use a CRM for efficiency. It’ll allow you to link contacts to deals, integrate email correspondence, see data insight in real time, automate tasks that will keep you on top of your game, and more. As the sales pipeline is built around your sales cycle, or all of the steps you take to close a deal, the first step would be to sort out the stages in your ideal pipeline so you can get your deals moving properly. It’s important to have an idea of how many deals you win on average, at any stage, so you’ll know whether you are on track to success — at any given moment. This insight into your conversion rates tests your sales process, evaluates whether your sales team is performing at the level you need them to, and exposes where you have very specific needs, according to Seger. This visibility allows a sales rep to know where they should be spending their time. McInnes explained that it’s especially important due to the diverse activities that happen in a salesperson’s day. Seger agreed, saying it’s easy to get lost in the activities without pipeline visibility. When you’re moving your deals stage-to-stage, it’s important to cite what factors help you advance your deal, so you can focus on performing those activities and continue to keep deals flowing in. It could be sending a written proposal, identifying the stakeholders, or getting a budget approved — there’s an event at each stage that moves the deal along. You can’t control results, but constantly focusing on these activities will inevitably lead to better results. Seger said pipeline visibility will also show you the obstacles that stand in the way of moving forward with a deal. In each stage of the pipeline, there’s a “pivotal decision to make — if we’re going to go the next stage,” she said. Knowing why a deal is stalling and how long it’s been in your pipeline so far helps you make that pivotal decision. A sales pipeline helps you see where multiple deals stand, so it’s easier to manage them and remember which steps you need to take to close many more deals. Activities that add new deals to your pipeline need to be part of your routine — daily or weekly, depending on your business. If you have a three-month sales cycle, for instance, and you’re only working on one deal at a time, you can only sell four times a year. You need to fill the sales pipeline with as many deals as you can, so you’re closing business every day or every week instead of every three months. “If you fill your pipeline, you can have a regular stream of business that’s closing, which means a regular stream of commission checks,” Wallace said. Having a sales pipeline will allow you to make smarter business decisions to obtain success throughout your entire company. McInnes added that sales pipeline visibility is critical to your entire business.